In January, the Equality of Opportunity Project published a landmark study that offers a major step forward in our understanding of higher education and economic mobility in the United States. 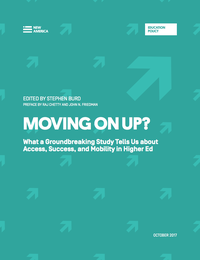 Mobility Report Cards: The Role of Colleges in Intergenerational Mobility provides the best available evidence that higher education can help students climb the economic ladder, and it also identifies specific colleges and universities that are the most successful at giving low-income students a leg up. At the same time, the research confirms that colleges heavily covet students from wealthy families, and help them excel further than their low-income peers. The Equality of Opportunity Project found that students from wealthy families were, on average, 29 percentiles higher in the wage distribution than their counterparts from low-income families. In many ways, higher education is reinforcing inequality rather than alleviating it. These findings are among many insights the research team was able to isolate, the result of putting the right data in the hands of the right researchers, who are generating important new knowledge in the higher education sphere that has previously remained unavailable or incomplete because of limitations in data availability and access. In the study, the authors connected parental earnings data to information on college attendance and children’s earnings in early adulthood to explore how college enrollment impacts students’ life trajectories. At New America, we recognized how groundbreaking the study was as soon as it came out. But we also noticed that, besides some excellent columns on the research in the New York Times, it wasn’t getting the attention it deserved from higher education reporters and researchers. The timing of the release was unfortunate, as it coincided with the ascension of President Donald Trump to the White House. Yes, we were all just a little preoccupied at the time. Low-income students, when given the opportunity, are just as likely to succeed as their wealthier peers, even at selective colleges. For low-income students, undermatching appears to be a much bigger problem than overmatching. In other words, these students tend to do better when going to more challenging colleges. Much as they do in elementary and secondary education, low-income students generally go to the colleges with the least resources, be they community colleges, regional state schools, or nonselective or barely selective private nonprofit colleges. These schools, as well as for-profit colleges that also enroll a substantial share of low-income students, generally have the worst outcomes, giving these students far less chance of succeeding than their wealthier counterparts have. This series also highlighted ways in which the Mobility Report Card data are unique, including how they allow us to see for the first time the share of wealthy students each college enrolls. In addition, we explored what the study tells us—and doesn’t tell us—about for-profit colleges. And we examined the data to see whether we could learn more about how higher education contributes to the wage gap between men and women. This paper contains versions of all the posts that were part of the series, which included an especially insightful one from Kelly Rosinger, a higher education researcher who now serves as an assistant professor of education at Penn State University. Even after we finished the series, however, we weren’t completely satisfied. So we decided to take an even deeper dive into the data to examine the state of equity and socioeconomic diversity in public higher education over time. What we found was startling and distressing. Our analysis showed that since the late 1990s, nearly two-thirds of selective public universities reduced the share of students they enrolled from the bottom 40 percent of the income scale, and nearly two-thirds increased the share of students they enroll from the top 20 percent. Most notably, at more than half of selective public institutions, the increase in affluent students came at the direct expense of low-income ones. In other words, these schools increased the share of students in the top 20 percent at the same time that they reduced the share from the bottom 40 percent. This shift to a more well-to-do student body occurred at many big-name public flagship and research universities that are leading players in the so-called merit aid arms race—devoting large amounts of their institutional financial aid dollars to attract wealthy students. For example, one of the largest shifts has taken place at the University of Alabama, which annually spends over $100 million in financial aid to students who lack financial need. These data should raise alarm bells throughout higher education and among policymakers. The doors of public universities are closing to the lowest-income students. Hopefully, the Mobility Report Cards study and data will serve as a wake-up call for all those who believe colleges should continue to give a leg up to those who are in most need of one.